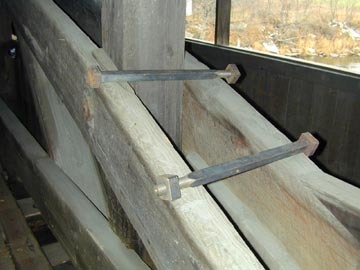 Waitsfield, Vt., November, 2001 - The Village Bridge has been undergoing repairs for the last few weeks. Traffic has resumed flowing across the old span since the first phase of the work was completed when eight floor beams and the deck planking were replaced. Work still to be done, explains Jan Lewandoski, owner of Restoration and Traditional Building, is the replacement of some broken timbers in the Burr Arch on the down-stream side and some work on the walkway. 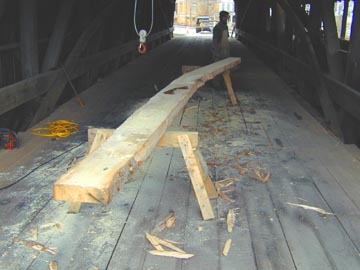 There has been a delay in the work on the arch until the right timber was found. "We replaced several joists that had become rotten, mostly from moisture condensing or traveling down the spikes and lags,"said Lewandoski. "To replace the broken arch segments I had to find a large spruce timber with the right natural curvature for the task, but I have it now. I blame the failure [of the arch] on the cantilevered snow loads applied by the walkway added in the 1940's. 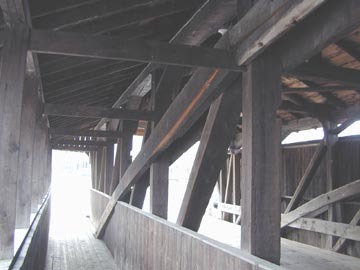 "I am also going to rectify the relationship of the floor and roadway at the east end, by jacking the joists and truss slightly, to reduce impact loading. "This is a remarkable bridge considering the heavy traffic, relatively long span, great age, and largely unaltered form." Upper Left Photo: The broken Burr Arch timbers. Upper right: The specially sought curved-grain Spruce timber. 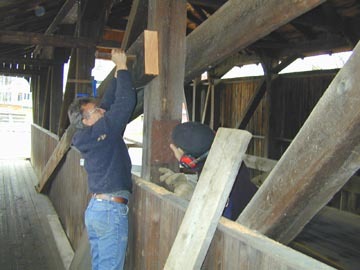 Middle right: Jan Lewandoski and Mike Cotroneo remove the broken timbers. 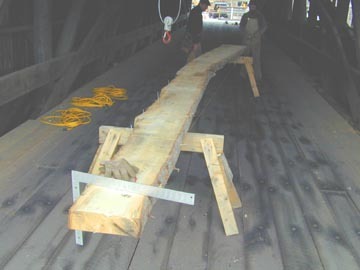 Lower right: The curved-grain Spruce timber is shaped and ready to be fit into the Burr- arch.